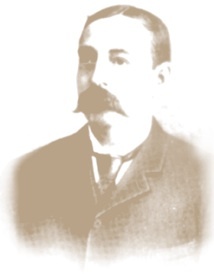 The city was founded in 1893 by Frank Hibbing. Frank Hibbing was born in Hannover, Germany, 1 December 1856. He set off to find his fortune in the 'New World' and settled in Duluth, Minnesota (via Beaver Dam, Wisconsin) in 1887. In 1892 he headed up a team of 30 men, cutting through the wilderness of Minnesota and using his expertise as a prospector to discover the existence of iron ore in the Mesabi Range. Frank Hibbing felt personal responsibility for the township that bore his name. His generous personal financial contributions provided the town with a water plant, electric light plant, the first roads, hotel, sawmill and bank building. Although he lived in Duluth, he maintained personal and business connections with Hibbing until he died from appendicitis on 30 July 1897, aged 40 years. Negotiations between the Oliver Mining Co. and the village finally brought about a plan whereby the entire city would relocate to a site two miles south near the small hamlet of Alice. The company, for its part, agreed to develop the downtown buildings with low interest loans that could be paid off over the years by the retailers. New civic structures such as Hibbing High School, the Androy Hotel, the Village Hall and the Rood Hospital were also constructed with mining company money. In all, about 200 structures were moved down the First Avenue Highway, as it was called, to the new city. These included a store and even a couple of large hotels. Only one structure didn't make it. A hotel tumbled off the rollers and crashed to the ground leaving, as one witness said, "an enormous pile of kindling". The move started in 1919, and the first phase was completed in 1921. North Hibbing remained as a business and residential center through the 1930's when the mining companies bought the remaining structures. The last house was moved in 1968. Please send us the URL of any relevant Hibbing photographs... and improve our site with potential text for captions! Engel, Dave. Dylan in Minnesota: Just Like Bob Zimmerman's Blues. Rudolph: River City Memoirs-Mesabi, 1997, 0942495616. Maki, Heather J. Hibbing, Minnesota. (Images of America), Charleston: Arcadia, 2001, 073851859X. Santelli, Robert. The Bob Dylan Scrapbook: An American Journey, 1956-1966. London: Simon & Schuster, 2005, 0743228286. Scobie, Stephen. Alias Bob Dylan. Red Deer: Red Deer College Press, 1991, 0889950695. Scobie, Stephen. Alias Bob Dylan Revisited, Calgary: Red Deer College Press, 2003, 0889952272. Sheehy, Colleen J, and Thomas Swiss. Highway 61 Revisited: Bob Dylan's Road from Minnesota to the World. Minneapolis: University of Minnesota Press, 2009, 9780816660995. Sounes, Howard. Down the Highway: The Life of Bob Dylan. New York: Grove Press, 2001, 0802116868. Thompson, Toby. Positively Main Street: An Unorthodox View of Bob Dylan. New York: Coward-McCann, 1971 / London: New English Library, 1972, 0450010120. Thompson, Toby. Positively Main Street: Bob Dylan's Minnesota. Minneapolis: University of Minnesota Press, 2008, 978081665445.